I don't blame you if you don't like Blue Cheese - it used to repulse me. The smell made me gag and the thought of eating moldy cheese made my stomach turn. And then one day, when I was pregnant (darn cravings! ), I decided to try some Blue Cheese on my steak - it had been placed under a broiler so the result was a wonderful crust. I was still a little hesitant... Verdict? I was very surprised to find out that it was SPECTACULAR!! Now I like Blue Cheese and there is no turning back. I can also thank pregnancy for my changed feelings of mushrooms, they also repulsed me. This dish would have never been made by me 5 years ago. Never. 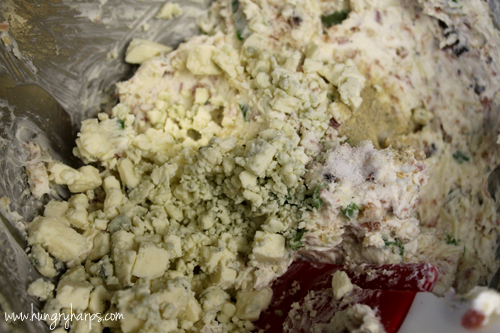 First, I mixed together cream cheese, diced bacon, chopped green onions, minced garlic and shredded parmesan cheese. Next, went in the Blue Cheese, salt and white pepper. It was mixed thoroughly. 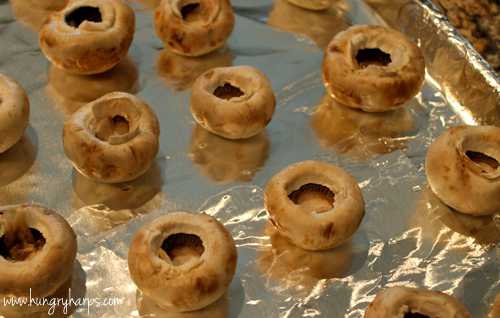 Then the mushrooms were cleaned and de-stemmed, placing them on a lightly greased baking sheet. 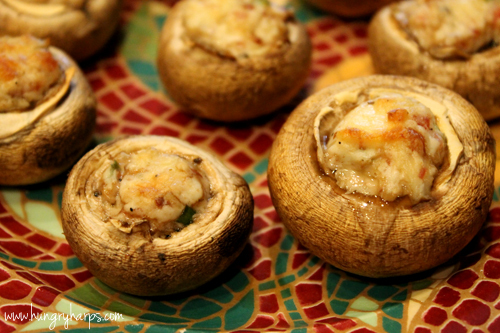 Each mushroom was filled with about 1/2 - 1 tablespoon of cheese mixture. I used a pastry bag, sans tip, to fill them and it worked marvelous! But they were not done yet! 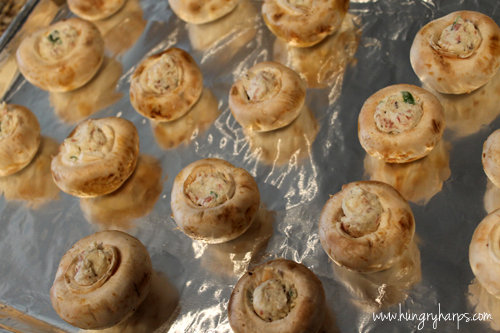 I put them in the oven at 375 for about 25 minutes - just until the tops were starting to turn golden brown. 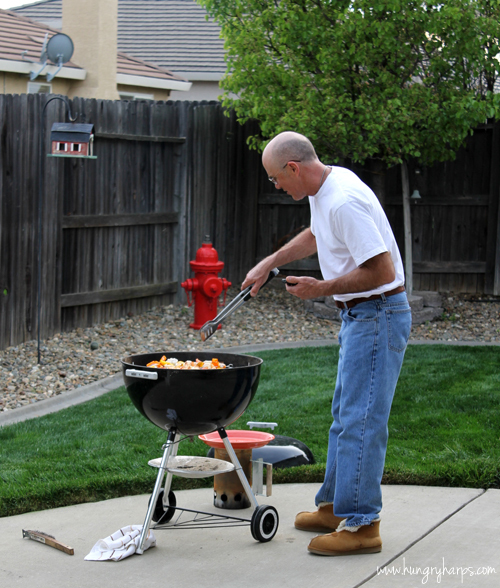 While the Blue Cheese & Bacon Stuffed Mushrooms were baking, my Dad was outside mastering the BBQ. He was so in the zone he didn't even know I snapped this picture! 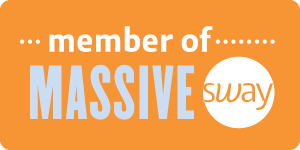 Hope everyone had a good holiday this past weekend! 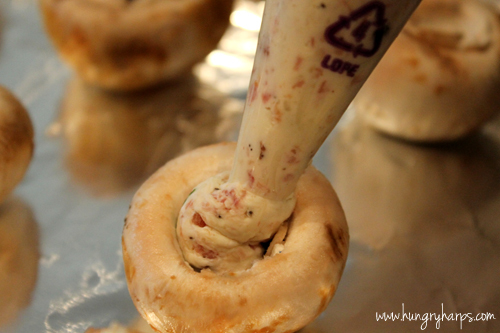 See you tomorrow with another Blue Cheese recipe! 1. Heat oven to 375, lightly grease baking sheet. 2. 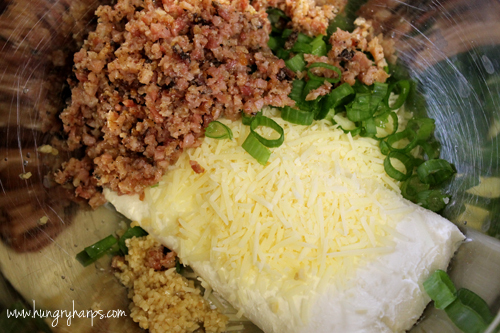 Mix together cream cheese, diced bacon, chopped green onions, minced garlic and shredded parmesan cheese. 3. Add blue cheese, salt and ground white pepper – mix thoroughly. 5. 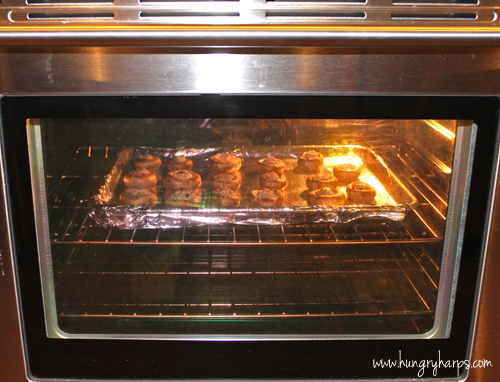 Bake for 25-30 minutes or until tops start turning golden brown. 6. Let cool and serve while warm. YUMMMMM...I had to pin this one so I can make these sometime!!! 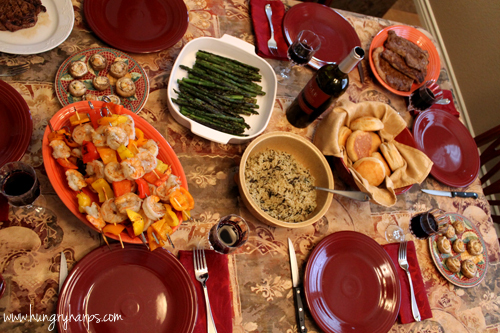 beautiful blog and post!!! Ooooh, can I get a huge platter of these? That looks amazing! The mushrooms look so good! That looks AWESOME!! I love blue cheese. One time, at a reception, I ate almost a whole wheel of it. I had a horrible stomach ache, but I didn't regret it one bit. NOT ONE BIT! Totally pinning this so I can make it later!